Champion stallion and gold medal mare out his first crop! Don Romantic excelled living up to our high expectations for his first crop. He sired the champion stallion in Herning Blue Hors Develino as well as the approved stallions Blue Hors Dicardo and Duendecillo P. Two of his daughters became champion mares at the regional gradings and one of them, H�nnerups Delay, was awarded gold at the elite show. Don Romantic himself does not know of defeat. 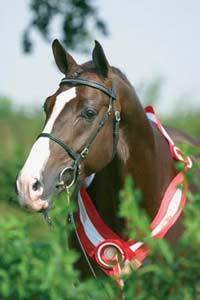 In 1999 he was the foal of the year in Danish Warmblood and in 2002 he became champion stallion and winner of the performance test. He took the champion title again in 2003 and was awarded the highly coveted challenge trophy of Aage Ravn as well as the gold medal, which has only been awarded to a young stallion twice before in the history of Danish Warmblood. Don Romantic won the dressage division of the performance test as well as he became the overall winner with nothing less than 885 points, scoring 10 for canter and ridability, and four times 9,5 from the test riders! At the young horse championship in Denmark Don Romantic won the qualifiers as well as the final for 4 year old horses at Vilhelmsborg, where judge Kyra Kyrklund gave him 10 for his canter. An excellent foal report from Danish Warmblood concludes that Don Romantic passes on his outstanding type, extraordinary basic gaits and matches a wide range of mare types. 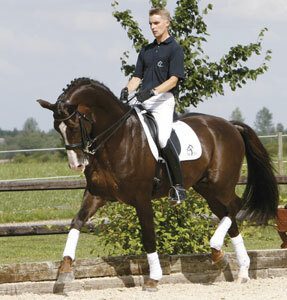 Don Romantic is solidly bred on dressage performance through Don Schufro, Romancier and thoroughbred stallion Mago. 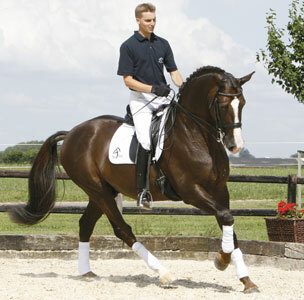 All three stallions have won international dressage competitions at advanced level. 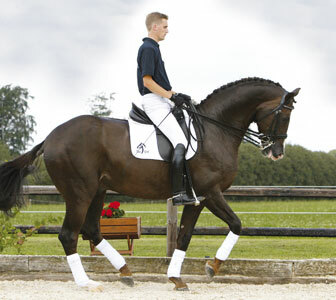 The dam lime has also produced the international Grand Prix horse Supermax Ravel. Don Romantic is approved in Denmark, Sweden, Oldenburg, Hanover, Westphalia and Rhineland.